New in 2018 by popular demand, across-state and multi-day bike rides are listed in a calendar format or an agenda format. Here’s a list of some of the top multi-day sponsored bicycle rides for 2019, listed by state. Most rides include mechanical support, medical support, meals, sag vehicles, and provisioned rest stops. As this is a work in progress, please email me if you know of other bicycle tours that should be included. Updated ride dates are noted in BOLD on the pages. It all started with RAGBRAI back in 1973. RAGBRAI (Register’s Annual Great Bicycle Ride Across Iowa) got its start when two writers at the Des Moines Register challenged each other to bicycle across the state. They issued an open invitation for readers to join them, and 114 cyclists rode the entire six-day trip. Looking back, they were grateful for the low number of cyclists, because the route had not been driven and no advance accommodations had been made with towns along the route. Today, the bicycle tour has swelled to include thousands of cyclists, so many that RAGBRAI limits the number of riders doing the entire week to 10,000. And RAGBRAI has become the model for across-state bicycle tours in some 40 states. Combining these across-state bicycle tours with other large sponsored charity rides creates a huge opportunity for cyclists to participate in sag-supported rides that touch the fabric of our country across its width and breadth. This list has grown to more than 130 bicycle tours in the past four years. Occasionally, someone will contact me with another ride to include on the list. In 2009, for instance, the Alabama Bicycle Coalition launched its first multi-day bicycle tour. This is great! I signed up for RAGBRAI this year and I’ll find out in May if I made the lottery. I’ve also been looking for other state sponsored bike trips to do. Thanks for the info! I’m sure I’ll be writing about this soon and I’ll include your site as a reference. Thanks again! If you want a support company, each of the three years my wife and I used Pork Belly Ventures, a small business formed by a couple (a volunteer fireman and a Ph.D. college teacher) from Council Bluffs. Outstanding support. Superb food. Bike repair people. Tents if you want to rent. A campsite each night for you if you have your own tent. Please use my name when you call, they will also become your personal friends. I have done RAGBRAI for the the last couple of years. That is the oldest and largest state ride. Great adventure each year. This year I am going to venture to diferent states. Would like to see about getting Xpedition G.A.P. listed on your website. It is a 3 day, 150 mile ride along the Great Allegheny Passage to help support and “Stand in the G.A.P.” for families battling childhood cancer. It might be helpful if these rides could be listed by month as well as by State. Thanks. I agree, Pam. That’s something I’ve tried a couple of years ago with a simple but couldn’t get it to work right. Let me think about it and maybe I can come up with a solution. Got a lot of irons in the fire, though, so it probably won’t happen to 2014… Yep, already putting stuff off ’til next year. Thank you for this Great bike tour inventory. May I suggest one thing: A listing by date would be wonderful! This is a great website for finding existing cross-state rides, as opposed to great ones of the past that, alas, are no more. 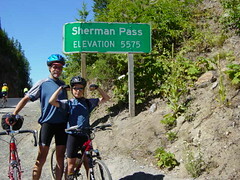 If you’d like to expand your list, I have also found a tour provider who stages a number of rides in Canada, at: http://www.cyclecanada.com/All.html. Some are one or two-day rides, others are continent-spanning rides. But a lot of them are week rides, such as the Tour Vert or the Bique Ride. Good information. I like to go for cycling holidays in Spain with family and friends. Did my first RAGBRAI just this year (8 days ago!) and it was great. While I registered I went with a group of unregistered guys and we camped at parks along the way. Had no problems. Great craft brew beer site set up about 10 miles from the day’s finish… sucked me off the road like a black hole. It’s become a big commercial event for all the little towns along the way, which is great for them. Des Moines Register article said it brings about 24.1 million in revenue to the state… I can believe it. Minimal traffic, great roads, still the granddaddy of them all. Whatever it is about bicycling that moves you, there’s no denying the magic of exploring the world by bike. I did a beautiful 7 Day ride called “The New England Classic” Tour de Cure to benefit the American Diabetes Association. It goes thru MA, NH, ME, and VT and fuly supported. It surely belongs on this page. What about Quebec and his Grand Tour.